Berlin has a great new hotel. Or, to be more accurate, Berlin has a great old hotel. The riddle is easily solved: The Adlon has been reborn. This mighty giant of teutonic hospitality began life in 1907 right next to the Brandenburg Gate, at the top of the German capital's most famous avenue, Unter den Linden. It burnt to the ground on the last day of the Second World War. Over half a century later, its beautifully-crafted recreation welcomes discerning travellers. Whether my recent fellow guest deserves that appellation, I do not know. As the head of state of one of the world’s more ‘controversial’ countries, he was certainly deemed to deserve one thing – security. I have never before witnessed in one place so many tall, besuited gentlemen with ear-pieces and bulges in their breast pockets. Still, the Adlon took it all in its stride, by now accustomed once more to the presence of visiting potentates. I, too, tried to cultivate a look of sophisticated nonchalance as I made my way through the spacious and richly furnished public areas on my way to room 352. This was an apartment (£330 a night for two) much to my taste. Vaguely Art Deco in style (thus the gold ceiling in the bathroom and the geometric design to the edge of the carpet), with pieces of furniture in the Biedermeier style and effective lighting from a mixture of table lamps and spotlights, it exuded an air of opulent good taste. The air conditioning was quiet, the bedside lamps were dimmable and the two easy chairs (in attractive brown suede leather) were comfortable. My windows overlooked the hotel’s inner courtyard, and I can therefore happily record that not a single decibel of extraneous sound disturbed my calm. For my ablutions, the beige and black marble bathroom was modest in size, but possessed of those features so necessary for the civilized life: a tub of good length, a proper shower cubicle, two wash basins and a separate loo. Strangely, there was no telephone – although I suppose I could have stored the mobile receiver from the desk in the bedroom in my dressing gown. Back at the Adlon I dressed for dinner in high spirits, for the hotel’s Lorenz Adlon Restaurant is currently the most highly rated in Berlin (5 knives and forks and one star in the Michelin guide). Chef Karlheinz Hauser’s food is described as ‘French with influences of Baden-Alsace’. All the dishes I tried were beautifully presented, intelligently conceived and full of clear, robust flavours. Unusually, several tasting menus (costing about £90 each) are offered. I am nowadays not a fan of these many-coursed affairs, but I have to salute the one I tried here – for its sheer artistry and its evidence of a kitchen on top form. Mosaic of crayfish and scallops with deep fried oysters was a superb confection, only marginally unbalanced by some over-dominant caviar. ‘Crème brûlée’ of foie gras with apples was gloriously rich. With lobster came the sweetness of chestnuts. Succulent sea bass was flattered and caressed by parmesan, asparagus and truffle – undoubtedly the best dish of the evening. Bresse pigeon with cabbage and chicory managed to be startlingly complex in the mouth. A cheese soufflé with figs and ice cream brought this fine meal to a conclusion. From a cellar full of greats (1982 Haut Brion is £360, 1985 Opus One is £260, 1991 La Tâche is £550) the sommelière, Nuria Frau-Trullén, brought me a white burgundy and a red bordeaux. The 1998 Puligny Montrachet was very French – elegant, restrained, with hints of sherbet and butter in the nose and long legs (J.M.Boillot - £65). The Lynch Bages demonstrated how often this chateau, even in difficult years (this was 1994 - £90), produces fine wine. Its firm balance of oak and black fruit was the perfect partner for the pigeon. Lovely drinking. My choice of the tasting menu had excluded the possibility of trying one of the dishes I had really wanted – the pressed duck. (Do not be put off by its description as ‘puréed duck’ on the English menu card.) So the splendid maitre d’ Jens Ast persuaded me to return the next day. And I was so glad I did. My three course meal began with red mullet with Provençal vegetables (excellent) and ended with a plate of strawberry puddings (delicious). But it was the duck which astonished me. It was expertly prepared next to my table by Mr Ast. First the meat was removed; then the carcass was crushed in a large silver press; finally, the resulting juices were combined in a frying pan with foie gras to produce the sauce. I put into my mouth a piece of the breast, soaked with this sauce, and experienced a moment of gastronomic ecstasy. Such tenderness. Such richness. Such depth of flavour. Then, as a separate course, the leg came with tiny pieces of bacon, a little salad, slices of black truffle and a truffle sauce. Nearly as wonderful. Do have this duck. And partner it, as I did, with a good chardonnay. This glorious dish has left me with the happiest memories of the Adlon. But even without it, my comfortable accommodation and fine breakfasts (everything from the comprehensive buffet proved of high quality), my experience of the staff, my wanderings around the immaculately kept public areas and my appreciation of the convenience of the location would prompt me to recommend it unreservedly. 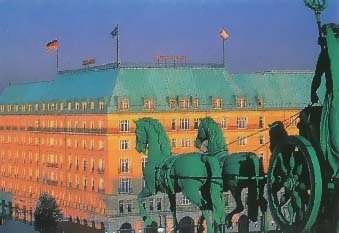 The Adlon was a great hotel. The Adlon is a great hotel. Unter den Linden 77, Berlin 10117, Germany.